Six years ago, Vincent Bonnay, a french filmmaker started the documentation process as Eyaks began to reconnect and strategize together as a community. 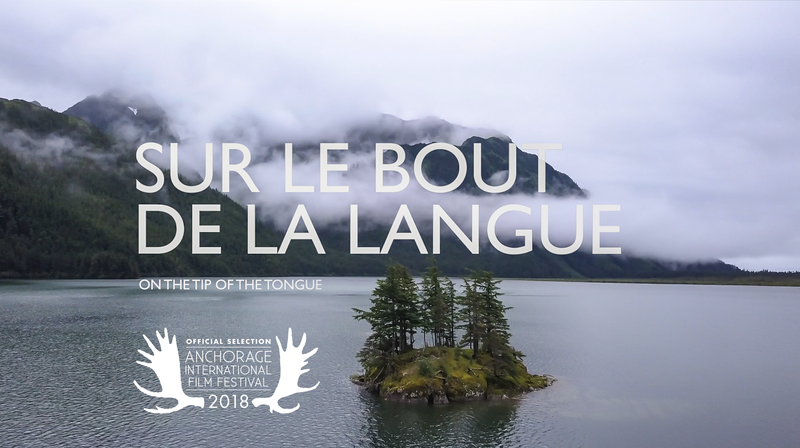 “SUR LE BOUT DE LA LANGUE” or “ON THE TIP OF THE TONGUE” is a result of this important work, telling the story of the encounter between the Eyak people and the young french linguist, Guillaume Leduey. The film was part of the official selection and premiered at the Anchorage International Film Festival 2018. As the smallest indigenous culture in Alaska, the Eyak battle towards revitalization is both a warning sign and a testament to how a language which has been declared “extinct,” can be redefined. Today, with the help of many talented supporters and with Eyak self-determination and guidance, the culture is beginning to thrive again. How did a young Frenchman provide the best hope for a people in quest of their cultural identity? When Guillaume Leduey was 13 years old, he discovered the Eyak culture when reading about endangered languages. At 20 years of age and upon the invitation of filmmaker, Laura Bliss Spaan, he travelled to Alaska and to Eyak ancestral lands in Cordova. This began Guillaume’s journey and surprising role at a pivotal point in Eyak language revitalization. Now, a fluent speaker, Guillaume continues to teach the Eyak language. Dr Michael Krauss, a linguist and professor, is still passionate about the Eyak and has been tirelessly documenting the language since the 1960s. Together, Guillaume and “Mike” are currently transcribing the Eyak Dictionary and texts to digital format and have become honored members of the Eyak community.